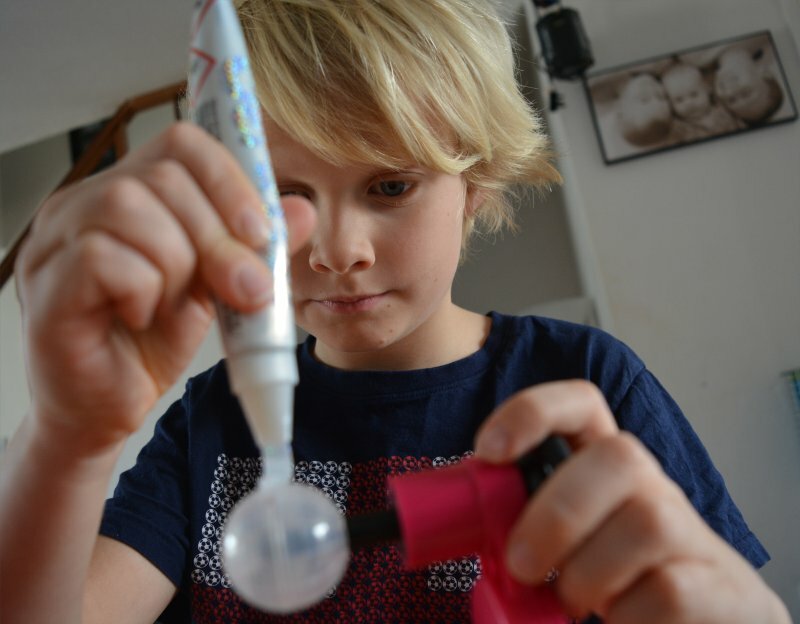 My boys love getting crafty and were keen trying to try the Gel-A-Peel 3D Design Station. The gels can be used to either trace a template on the 3D Design Station or let the imagination run free. Once it has dried then peel off the creation and use as 3D accessories. The Gel-a-Peel 3D Design Station itself allows for different size creations by the use of adjustable sides (moved by the press of a button) that can be moved forwards or backwards before being locked in place; then during the creative process can be rotated around in circles from either side of the Design Station. Also you can raise and lower the designs. Underneath are two drawers that slide out like doors, with plenty of room for storing accessories or building materials. 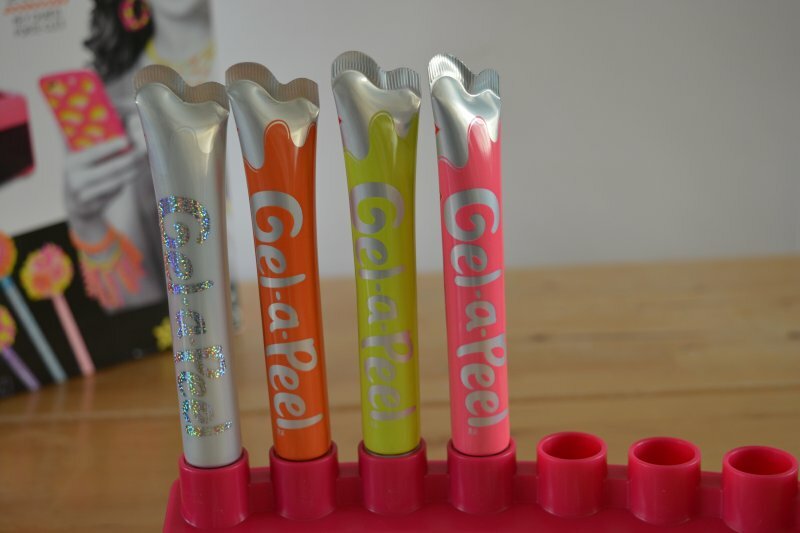 The Gel-a-Peel 3D Design Station also comes complete with 36 design templates, 4 gel tubes (yellow, orange, pink and white), a Gel Tube Stand (for holding the gel pens and spaces for storing the tips), 6 designer tips (including 4 round tips, a rake tip and a star tip! ), mobile phone cases to decorate (for iPhone 5 & 6), 4 earring hooks, 4 jump rings, 2 keychain rings, 2 keychain plus for spheres, 2 plastic 3D sphere templates for designing pencil toppers, a plastic cone 3D templates (to design bracelets and earrings), a tip cleaning spatula and instructions. 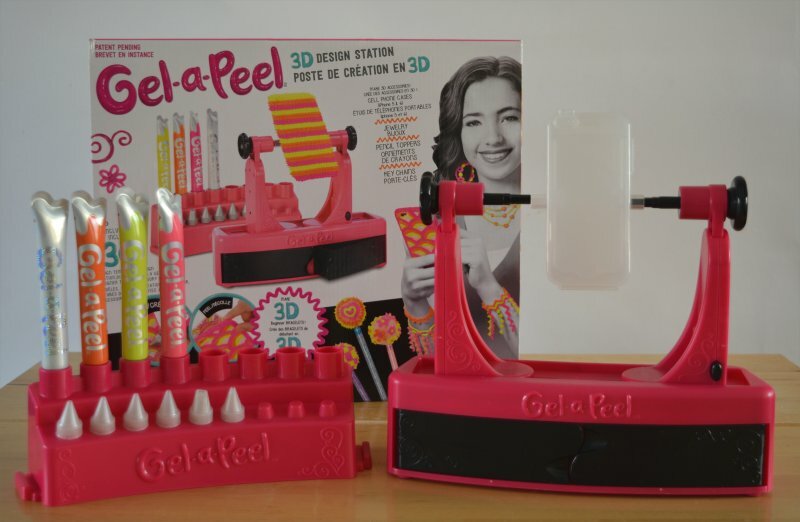 The idea of The Gel-a-Peel 3D Design Station is simple that it gives a secure base and simple instructions on how to design different accessories using gel pens to follow guidelines (or create your own) which can be peeled off and used to make all manner of things such as earrings, bracelets, pencil toppers and mobile phone cases. I liked the ease of use of The Gel-a-Peel 3D Design Station which meant that the boys could quickly and get started with no trouble. Easy to use straight out of the box (which was not hard to get out – no unnecessary tags etc). The only thing that was a little confusing for them initially was that the instructions were written in so many languages it was unclear where to look for what they wanted (as they were super keen to get started). Although The Gel-a-Peel 3D Design Station is for those ages 8 and over, our 7-year-old enjoyed trying it out under supervision. I can see why it is meant for over 8 however, as it does require a bit of precision or some of the designs will not work properly. It also involves having some patience as you need to let each colour dry for 15 minutes before adding the next one. My biggest criticism of the product is that it is clearly aimed at girls. The packaging is predominately pink, with a girl in the picture and the gels are colours generally associated with being feminine. I think this is a shame as it is obviously a universal product as both my boys loved it – and boys can have friendship bracelets too so why not be able to design them. Overall we were all happy with the product (my boys actually didn’t care about the pinkness) and are pleased to see that more gel pens can be bought for the kit (with spaces for them on the tube station). It was easy to clean (you just wait for any gel to dry and peel it away) and not a messy product at all really. My younger son did break some of his trying to peel it away (but again he is under the age recommendation). Would definitely recommend this product. I received a free Gel-a-Peel 3D Design Station for purposes of review. All words and opinions are honest and my own. Oh this is interesting. I’ve read a couple of reviews of this for making jewellery and it seemed a bit fiddly and hard work. This review inspires me a lot more, the design station seems to make it a bit easier. I’m always gutted about the way things are marketed as being gender specific when they don’t need to be.